Among the sparkling festive lights of Doncaster’s town centre, everyone’s getting ready for the season of merry-making: time to feast with friends and family and enjoy a holiday of gifts and games. Exactly 100 years ago, people were walking those same Doncaster streets with very different reasons for hope and joy in their hearts. Doncaster was getting ready for its first ‘Peace Christmas’, after four years of the world’s largest war. Local volunteers and historians have been exploring the archives to shed light on Doncaster’s wartime Christmas, for Doncaster 1914-18, a community project supported by National Lottery players through the Heritage Lottery Fund (HLF) to commemorate the First World War. The project has been uncovering extraordinary stories about Doncaster’s people and places in the final months of the First World War – and they’re hoping that local people can help unearth even more of this hidden history, to build an everlasting digital memorial. When Armistice was declared on 11th November 1918, the news was met with celebration on the streets of Doncaster. Hundreds gathered on the steps of the Mansion House to hear that peace was on its way. Crowds lined the streets from Scot Lane to Clock Corner. Workers poured out of factories, flags were waved from windows, bands burst into song, strangers hugged, and school children were sent home early. Jubilation was in the air. Families across Britain looked forward to the first Christmas in four years, even calling it the ‘Peace Christmas’. Over the month that followed, men began to return home. Prisoners of war were released, and soldiers stationed around the world started the long journey back to Doncaster. However, the reality of bringing the lads home was a slow process. By Christmas 1918, the war had only been over for 44 days, and many loved ones were yet to be reunited. Throughout December, newspaper reports trickled in of men still missing in action, killed in accidents, or fallen victim to disease. Prisoners of war returned with new tales of horror. Families who had prayed that their loved ones might turn up alive were starting to lose hope. For many on the First World War’s front line, military life continued. While the fighting had stopped, creating an eerie sense of quiet in the trenches, there was still work to be done. Part of the King’s Own Yorkshire Light Infantry, one of Doncaster’s local regiments, marched into Germany and occupied Rhineland. Other battalions stayed on duty in Belgium. The lucky ones withdrew to the coast and prepared for demobilisation. Priority was given to men who had essential skills, such as miners, who were needed back in Britain. Soldiers would travel back to England in uniform, with all their equipment. They remained in the Army until they were officially released, usually after 28 days. During this time they were allowed to wear their own clothes. After that, they had to return their great coats to a collection point, normally the railway station, where they would exchange it for one pound. They could also exchange their ration book for a civilian one. Many men had dreamed about returning to home-cooked meals during the long days of war, but rationing – introduced in January 1918 - continued into Christmas 1918. Sugar, meat, butter, cheese and margarine were all restricted, while the Doncaster Gazette reported that there was a shortage of fruits for cakes and puddings, as well as spirits and other alcoholic drinks. Families refused to miss out on their Christmas treats, however, getting creative with the ingredients available to them. Christmas dinner was served with less meat, and sweet recipes were adapted to fit the rations. The recipe for imperial biscuits, pictured, is a great example created by Yorkshire-based baking blogger Meryl White, who features many wartime recipes on her www.grandmaabson.com website. While many Doncaster families looked forward to a peaceful Christmas with loved ones, the consequences of the war continued to intrude on daily life. With dead soldiers’ pictures still scattered across newspaper pages, fathers and brothers still serving abroad, and food rations firmly in place, it seems that Christmas 1918 was, for most, not a celebration but a sigh of relief. Doncaster’s families made a huge contribution to the war, and to the world we know today, but as the First World War passes out of living memory, their stories are at risk of being forgotten. This Christmas, the Doncaster 1914-18 project is appealing to local families to help shine a festive light on Doncaster’s wartime Christmas, by sharing stories and photographs - not only helping to piece together Doncaster’s wartime past, but also helping to build an everlasting digital memorial to our First World War families, free for everyone to use and share. 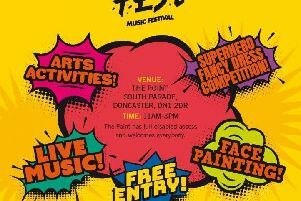 To find out more, including news of events and exhibitions taking place around the borough of Doncaster, visit www.doncaster 1914-18.org.uk website.